When comes spring, and the following summer, the well-known song that summer is our life in a miniature comes to my mind first. People in our country value every day with the fair weather. They make plans for the upcoming summer, anticipate a good yield, or travel far from their homes. Admittedly, summer is the period of active getaway and relax. Everything wakes up, tempting by its novelty, new sounds, and smells, and the magic word «plan-air.» is becoming for me like a motto. It goes without saying, for an artist, nature is an inexhaustible source of new ideas, positive mood and inspiration. What’s more, nature is the first teacher for us. Working in the open air, as well as the copying of the masterpieces of world painting, are the two crucial things for an artist; it is the basis of the classical school of painting. As for me, the spring is the time when I look forward to meeting with nature. It takes quite a lot of time, but it’s amazing! I usually revise all equipment: paintbox, tubes with oil paints, brushes, and other materials for this activity, anticipating this going out. Every year I take the opportunity to paint outdoors, and every time, while working on every other landscape, I set new goals. I like new challenges when trying to express in my pictures the changing environment. Very helpful it for me, though, apart from this it also clears my eye, as many artists admit, and it’s an effective method of recharging my batteries. In addition to this, it is also important for me as a teacher to pass on my experience the students more effectively. Before you start working on an individual painting, watercolour or even sketch, you should choose a proper place and build a composition which suits best your goals. The next step is to identify the light and atmospheric effects at the moment to express the environment in a better way. Furthermore, it would be a good exercise to paint a series of sketches, the exercises with light and atmospheric effects in the different time of the day. In my opinion, the brightest example of this task is the Claude Monet’s series of the views of the Rouen Cathedral. I think, every time of the day or weather is enjoyable in their way: it’s up to you to find out more attention grabbing atmospheric effects, whether it would be a sunny, or rainy weather, for the evening or daylight. One more aspect to be taken into account is that you should choose for each task the right art materials. The distinct lines and contrasting shadows better outline the objects in broad daylight, while for misty or rainy weather, watercolours and other similar graphic materials are, by far, the best. And finally, the correctly chosen layout of the canvas or paper better organizes the composition of your artwork. One more challenging task in landscape painting is to show the relations between the elements of nature, park sculpture, and landscape design. Catherine Palace and the Cameron Gallery in Tsarskoye Selo, the Palace and the Centaur Bridge in Pavlovsk, are undoubtedly the objects I like to paint again and again. I like to find out more challenging tasks on how to express the interaction between light and shadows or to show the texture of the material and the shapes of the architectural forms. Undoubtedly, in a bright sunny day, the correlation between light and shadow are more distinct: it looks like the sunlight builds up the forms, making more tangible and visible the material from which the building was built. For example, the limestone from which the Cameron Gallery was built, in the bright daylight looks differently than in a foggy day: sunbeams make the whole building look more lightweight than it is. On the contrary, in the case of scattered light, we usually get the impression that the object is connected more closely to the environment, looking less distinctly. The smooth lines and the refined nuances of colour create the lyrical mood in the landscape. The evening light creates a more romantic image of the object, giving the room for our imagination. We become to be more involved in a historical atmosphere through its artefacts, whose connection with the historical period we feel more distinctly. One of the most important elements of landscaping is the variety of trees. In the regular area of the park, lime plays an important part, as the tree which is the best for topiary: its crown can easily be trimmed and transformed into the different geometric forms. Oak, is an another example: the fantastic linear structure of its branches and trunk, as well as amazing foliage, is the best for creating the romantic atmosphere of the park and the illusion of the identity of the real natural environment due to the human’s perception of nature. 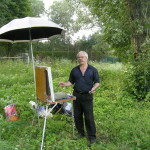 Very often, an artist faces the two common problems while painting a landscape. The first is the limit of time when finishing of the work is almost impossible due to the circumstances, and the second one is the changing daylight. It can’t be doubted, sketching is the best possible solution to this problem. The more sketches you do, the better it is for your future completed work. It goes without saying, for the finished work, generalization and the ability to find the most essential, is vital. Any sketch shouldn’t be ignored, even those one which you regard as the most meaningless, because every small detail could make you look at your future work from another angle, giving the opportunity to remember the most important aspects which have been missed. To sum up, art for me is a powerful tool in expressing the idea of the unity between humans and nature. For the last decades, the concept of the eco-friendliness and sustainability of our lifestyle is becoming more and more popular, therefore, in my view, art, and culture are to play a major role in getting this message across to people.